Being the most famous monument in Greece and voted the Leading Tourist Attraction by World Travel Awards 2018, this one should be a no brainer. The Acropolis was developed in the 5th century BC and is the origin of many innovative ideas and theories of that time. Spend a couple of hours at the Acropolis Hill, wander around the ancient monuments and marvel at the Parthenon (built in 438 BC). Afterwards, head over to the theatre of Dionysus, known as the first theatre in the world. Make sure to get an early start of the day as the crowd gets a bit heavier later on! 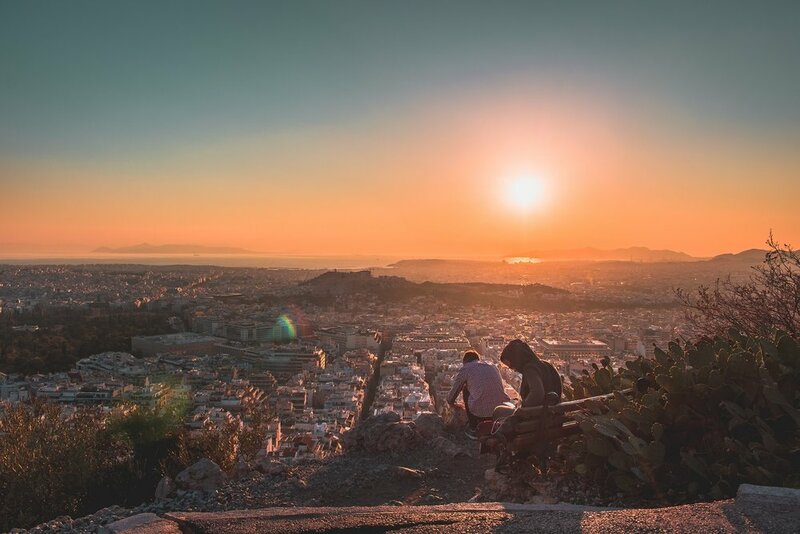 Once you are done, head over to Philopappou Hill, right opposite to the Parthenon, and enjoy a marvelous Acropolis view while listening to the stories of ancient Gods and legends in our mythological "Boudoir of the Gods" tour. 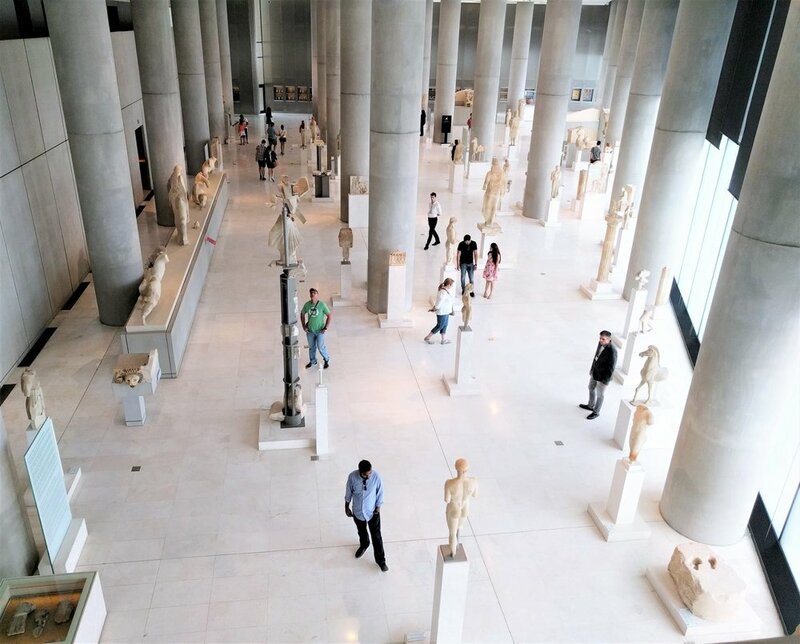 Named as one of the top 10 museums in the world by National Geographic, the Acropolis museum is a stunning archaeological museum focused on the findings of the archaeological site of the Acropolis of Athens. Stroll down the transparent glass floor, get with a gorgeous view of the Acropolis through the glass windows, take in the spectacular exhibits, and expect to get an in-depth understanding of the history behind the Acropolis and Greece as a whole. Whether or not you’re an art and history buff, this museum is a must-see (find out the best 5 museums to visit in Athens here). See the best Athens has to offer in just a day! Plaka is an incredibly charming old neighborhood in central Athens. Grab some gelato and take a stroll down the enchanting streets of Plaka and take in the unique and colorful buildings and scenic views of the Acropolis. Enjoy some authentic Greek cuisine at one of the numerous restaurants, and shop for souvenirs in the quaint shops. After a long day you’ll want to destress and pamper yourself with a tranquil steam bath or massage at Al Hammam, a unique and traditional bathhouse inspired by ancient routines from Asia. A lively central market that’s especially preferred by locals where you can find fresh meat and fish. Cheese, wine, oil, spice, fruit and vegetable stands are also around the main market at a reasonable price. Aside from tasting the olives before purchasing your favorite, sip on some authentic strong Greek coffee, thus you really get a vibe of the city. A popular delicacy sold here is the “pastourma”, which is dehydrated meat covered with a cumin paste, served with garlic, hot paprika and other spices. This market has been in business continuously since 1886 and is open everyday except for Sunday (like most grocery stores in Greece). 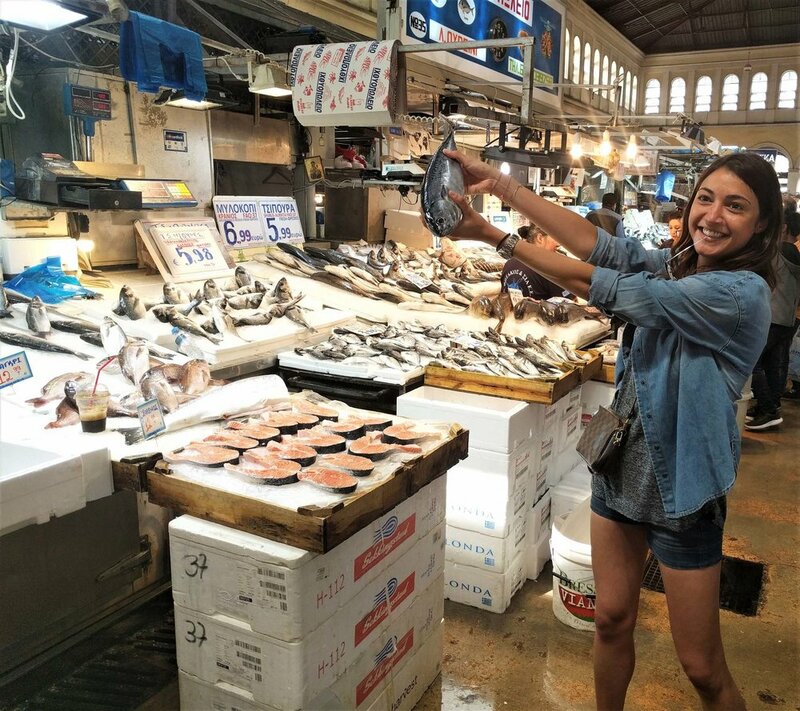 If you'd like to know more about the traditional Greek products and even taste some, then you should not miss our "Get a Taste of Athens" food tour, which runs three times per week at 09:30! Taste the best street food of Athens! Built around 330 BC, it is also referred to as the Panathenaic Stadium and is able to accommodate ~50,000 spectators (60,000 people - the largest crowd ever - watched a live basketball match between AEK and SK Slavia Prague there in 1968). The name Kallimarmaro literally translates to “beautiful marble”, which is aptly named as it is famous for being the world’s only stadium made entirely out of marble. The stadium is rich in history as it is home to where the first Olympic Games were held in 1896. During the 2004 Olympics in Athens, it was used again for various purposes. Do not lose the chance to feel like a proper Olympian as tickets are also relatively cheap to enter the actual stadium grounds (5 euros). You could even run next to the Stadium and around the city as the ancient Greeks did in our Running through History tour. If you want a stunning panoramic 360 degree view of Athens, look no further. Standing 277 meters above sea level, Lycabettus Hill is the highest point of Athens. After about a 20-30 minute hike or 5-minute car drive to the top, you’ll find a rooftop terrace of the Orizontes restaurant where you can dine with the most incredible views of Athens and the surrounding mountains. At the very top of the mountain you’ll find a church and places to sit and enjoy the views. The best time to go is without a doubt at sunset. Undoubtedly the heart of Athens, Syntagma Square is the central and most renowned square in Athens found across the Parliament, which actually used to be an Old Palace. From here, you are within walking distance to most important monuments, streets and sights. Although the Parliament is not open for the public to explore, you can observe the Parliament guards called “Evzones” and their hourly changing in front of the tomb of the unknown soldier. The ceremony is followed by special military steps and positions of their rifles. Evzones wear handmade uniforms and shoes and they are really interesting to watch. The best time to see an extended ceremony, as well as more evzones, is every Sunday at 11 a.m. If you want to capture the most-photographed touristic attraction in Greece with your mobile or with an instant camera, then do not miss our "Athens Instagram Photo tour", realized four times a week. Take a tram from Syntagma and head to the coast towards the Athenian Riviera. Explore the promenades of Flisvos marina where you can expect to see luxury yachts, and of course bars and places to grab a bite or drink an aperitivo by the sea. If you’re in the mood to be a bit more adventurous, venture out further south all the way to Glyfada where you can do some more sightseeing, lay by the beach or take a plunge in the sea. Cape Sounion is the southern most point of the Attica region to explore; here you’ll find the Temple of Poseidon, one of the major monuments of the Golden Age of Athens. Explore Sounio, the Athenian Riviera and the temple of Poseidon! An architecturally beautiful and unique complex that houses various facilities such as the National Library of Greece, the Greek National Opera, and also the Stavros Niarchos Park. It replaced and reconstructed an abandoned seafront piece of land in the bay of Faliro. SNFCC organizes various cultural and athletic events all year round with most of them open to public. The most popular ones are the sailing and kayaking in the canal, free guided tours inside the centre, open-air cinema with free screenings of classic films, yoga and pilates sessions in the park, music and dance events etc. It is a wonderful place to relax, walk, read, and have a panoramic view of the whole city from the roof top. Definitely a worthwhile place to visit in Athens! The vibrant Greek capital offers nightlife entertainment options for all different kinds of taste. The city truly comes alive at night so you won’t have any issues finding a bar or club to dance the night away. Monastiraki, Psyrri, Metaxourgeio and Exarcheia are popular neighborhoods where you’ll find a line-up of places to go and sip on some rakomelo (a hot mixture of the alcohol beverage raki with honey), or the Greece’s national beverage, ouzo. If the bars or dancing isn’t your thing, then consider heading over to Cine Paris in Plaka, a gorgeous rooftop outdoor cinema, where you can relax while watching a movie under the stars. Did you like our post? Pin it for later! 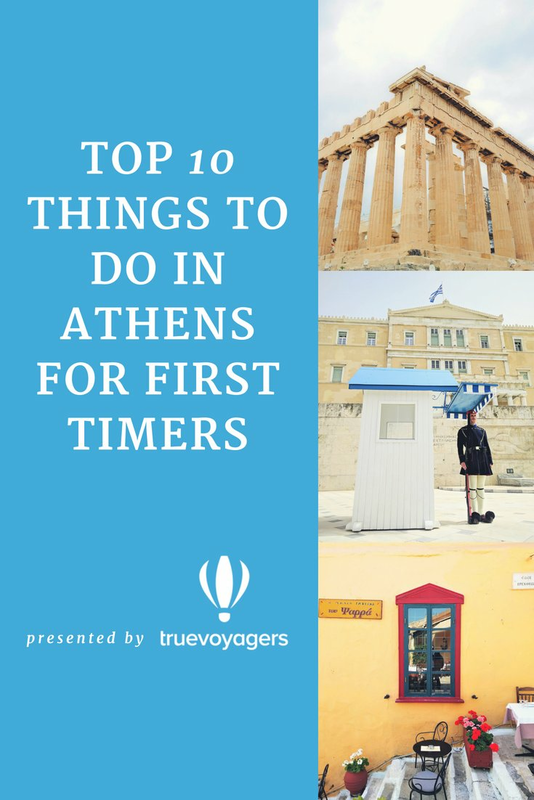 What were the things you did and the places you visited during your first time in Athens? Let us know by commenting below!